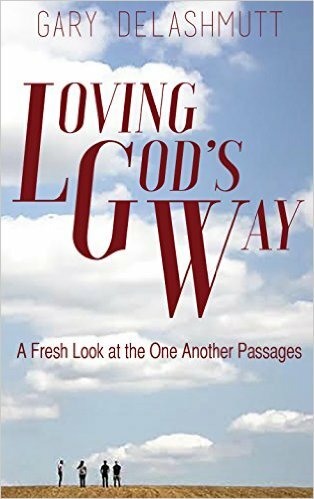 Get a fresh look at the One Another passages in Gary DeLashmutt's book, Loving God's Way! The historical-critical method assumes that words and expressions have a relatively stable meaning during given periods of history. Therefore, we begin by taking what we can determine as the normal, everyday meaning of the words, phrases, and sentences to the extent possible. In other words, our interpretation must correspond to the words and grammar in the text in a reasonable way. Otherwise, the interpreter could assign meaning of his own without objective control. The Bible would become a horoscope of vague sayings we try to plug into our lives however we are able. Most of the Bible can be easily interpreted by simply taking the language (either in the original or translation) in the usual way (Jn. 3:36; Acts 1:11). In other words, if the plain sense makes sense, seek no other sense. A plain sense reading should not be confused with a literalistic interpretation. We should allow for figures of speech (Mk. 1:5; Lk. 22:19). Historical interpretation means that we take into account the historical background of the author and the recipients as possible. The Bible was written to common people, and is understandable to anyone. However, it was written thousands of years ago to a different culture. Therefore, as modern readers, we have to try to recover a general sense of the meaning of words, phrases and concepts in the ancient cultures. These phrases are addressed in Scripture primarily to the Hebrew and Greco-Roman culture of the first century. We are not interested at first in the question, "What does it mean to me?" but rather, "what did it mean to those whom it was originally written?" Rev. 2:12,13 - Pergamum was the center of the worship of Aesclepius. I Cor. 11:4-6 - Shorn hair was typical of Aphrodite priestess-prostitutes; shaven heads were typical of convicted adulteresses (vs. 5). Use Bible dictionaries or other sources to discover customs, money, geography, etc. Then find a corresponding meaning in our culture. Your interpretation must make rational sense. If interpretation is permitted to contradict, there in no reason for hermeneutics since we may make a passage say whatever we want. These rules will enable you to arrive at a critically sound interpretation. Some of these rules are the outgrowth of a high view of scripture. In other words, the entire Bible is the product of one author (God) at the same time that it is product of many authors. Therefore, it is not unreasonable to seek to find a consistent message throughout the Bible. Interpret in light of the context of the passage. Follow the thought development in the book you are reading, and make sure your interpretation flows along with the general direction of argument. Sudden changes in subject are unusual. If you have the thought development of a book centering on one subject, suddenly switching to another, and then back to the first, your interpretation is almost certainly wrong. Consider the larger context as well: which Testament? which author? what time period? Never view a passage in isolation from its surroundings. The context should be considered the most important kind of evidence in the interpretation of a passage. Usually context supplies all we need to know. We should turn to other explanations only when we can find no critically feasible interpretation based on the English text in context. Anyone who claims to see a break in context bears the full burden of proof. Interpret in light of progressive revelation (Heb. 1:1,2). While God's purpose for man has never changed, His strategy in accomplishing that purpose has changed. He has dealt with man under different "covenants," or programs. Therefore, it is important to ask "Under which program was this written?." Primary application of the passage will be to the people operating under that program, but not necessarily to others. There may be secondary applications for other programs based on principles which have universal application. Note special problems here in connection with the ministry of Christ before the cross. Animal sacrifices, dietary laws, Sabbaths, holy days, festivals, priests and liturgy have all been fulfilled in Christ and are thus obsolete (Col. 2:16,17; Heb. 8). Interpret scripture in harmony with other scripture. Since the Bible is inspired by God, it does not contradict itself. Therefore, never interpret scripture in such a way that it clearly contradicts other scriptures. First discover the allowable range of meaning for a passage, then choose the interpretation that doesn't contradict other scriptures. Acts 2:38 could either be referring to baptismal regeneration, or simply adding baptism as a desirable adjunct to the minimum requirement for salvation (i.e. faith). Jas. 2:14-26 "justify" can also mean "justify before men." Interpret the unclear in light of the clear. Scripture teaches every major, essential truth clearly and many times. Never build a doctrine on an unclear passage. Lk. 16:9 is used by Roman Catholics to support indulgences. I Cor. 15:29 mentions an obscure, unknown practice used in Corinth. Today the Mormon church uses this passage to elevate dead ancestors to a higher status in the afterlife. I John 5:16 The sin unto death is never defined. Don't base a doctrine of falling away on such a passage. Interpret the "spirit" of the passage, not necessarily the "letter", or the literalistic meaning, especially when the text is a literary genre prone to figures of speech or colorful statements. Proverbs 22:6 The book of Proverbs contains many general maxims, but not all are absolute promises. Not every child will go right, but most will. Proverbs 15:1 Not every gentle word will turn away wrath, but in most cases it will. I Cor. 11:1-18 - In some New Testament passages interpretation by the "letter" contradicts the "spirit" of the passage (c.f. I Cor. 10:32,33). Interpret with dependence upon the Holy Spirit, allowing Him to teach you. Reflect on whether these are True or False. Then check your answers below. Proverbs 3:5 "Lean not unto your own understanding" means we should avoid approaching the Bible on a primarily analytical level. Since the Bible is "living and active", the interpretation of a passage may be different for different people. Unless we approach God's word with a deep reverence for God and a passion to know His will for our lives, we may often get the wrong interpretation. If the rules of interpretation give one answer and the Holy Spirit shows another, we should choose the latter. We should pray before studying that God will enable us to understand the passage. Proverbs 3:5 "Lean not unto your own understanding" means we should avoid approaching the Bible on a primarily analytical level.F—This passage is primarily urging humility as a general principle, whether intellectual/analytical or spiritual: one’s inner spiritual intuitions are just as in danger of misdirection as the mind (cf. Jeremiah 17:9). F—The relevant message of Hebrews 4:12 is that God’s Word applies in many situations, but not that its actual meaning varies. Furthermore, the very citation of Hebrews also presupposes a single interpretation. T—Passages like John 7:17 and 1 Corinthians 2:14ff indicate the importance of the Holy Spirit in approaching the Word. F—This is doubly problematic: (i) it creates a false dichotomy between hermeneutical standards and the guidance of the Spirit; (ii) our inner sense of the Spirit’s guidance must be largely constrained by proper interpretation of Scripture! T—This statement indicates a healthy balance: it is neither super-spiritual because one is studying but it is not exclusively academic because we seek the Author’s guidance as we do so.